Higher oil prices, resilient global growth and accommodative financial conditions promise to cushion the Middle East and North Africa’s economic slowdown from the effects of oil production cuts. According to our latest estimates, the region’s economies expanded an aggregated 2.1% annually in Q2, up from the 1.8% rise estimated last month, mostly reflecting better-than-expected economic dynamics in Iran. Tensions between Iran and Saudi Arabia continue to threaten the stability of the region, however. Saudi Arabia stated that the missile targeting the Riyadh airport on 4 November was launched from Yemen and represented “an act of war” by Iran. The missile, which was intercepted by the Kingdom’s defense systems, was fired from areas under the control of Houthi rebels, who are supported by Iran. The two regional superpowers are engaged in a proxy war in Yemen, which is causing a humanitarian catastrophe, aggravated by a three-week Saudi blockade that was a retaliatory measure for the missile attack. The regional rivalry between the two countries also reverberated in Lebanon. On 4 November, Lebanese Prime Minister Saad Hariri, who was in Saudi Arabia at the time, suddenly announced his resignation, citing fears he could be assassinated in a plot led by Iran. He also criticized the role of Iran and its Lebanese partner Hezbollah in the Arab world. Lebanese officials insinuated that Saudi Arabia had forced Hariri to resign to destabilize the current Lebanese government, which is partially controlled by Hezbollah. The domestic political crisis eased to some extent on 22 November. Just a few hours after his return to Beirut from Saudi Arabia, Hariri postponed his resignation. Iran and Saudi Arabia are also facing severe challenges at home. The Islamic Republic is grappling with fears that the United States will reinstate economic sanctions that could jeopardize Iran’s economic recovery, particularly following U.S. President Donald Trump’s decision to “decertify” the nuclear deal on 13 October. This move paves the way for the U.S. Congress to take additional legislative action against Iran, targeting Iran’s ballistic missiles program in particular. In Saudi Arabia, 32-year old Crown Prince Mohammad bin Salman is quickly consolidating his grip on power. On 4 November, he coordinated the arrest of more than 200 members of the Saudi elite, including ministers, princes and the region’s wealthy tycoon Prince Alwaleed bin Talal amid corruption charges. While the anti-graft crackdown has the potential to disrupt economic activity in the short term, it could also shore up Salman’s reformist agenda. Nevertheless, Salman has adopted a tough stance against Iran, which could lead to further political and economic destabilization in the Middle East. Although the region will benefit from higher oil prices and strong global growth next year, rising geopolitical risks hamper MENA’s growth outlook. Moreover, the region could suffer from monetary policy normalization in the United States. The region is expected to grow 2.9% in 2018, which is down 0.2 percentage points from last month’s estimate. Our panel projects regional growth of 3.3% in 2019. This month’s downgrade to MENA’s economic outlook for 2018 reflects lower growth prospects for Algeria, Iran, Iraq, Lebanon, Morocco, Saudi Arabia, the United Arab Emirates and Yemen. Nearly all the remaining economies saw their forecasts unchanged. Egypt was the sole economy to experience an upgrade this month. 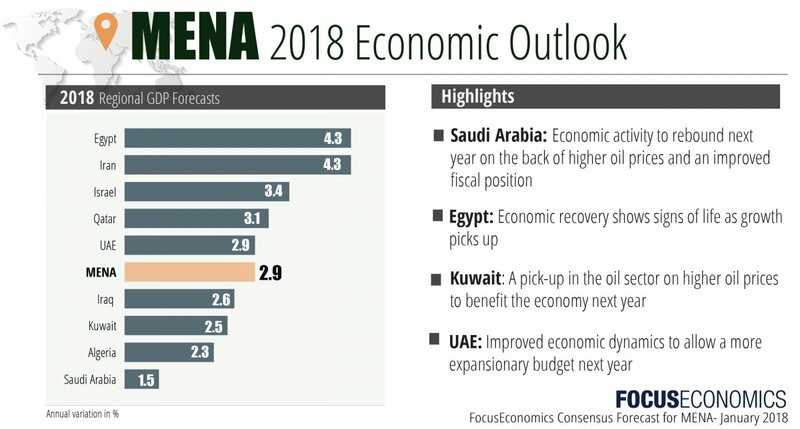 Egypt and Iran are expected to experience the fastest growth among MENA countries in 2018, expanding at 4.3%. At the other end of the spectrum, Saudi Arabia is expected to be the region’s worst performer due to increasing political unrest and reduced oil production stemming from the extension of the oil cut deal into 2018. Although the Yemeni economy is expected to experience a sizeable 4.0% next year, panelists have cut 5.5 percentage points from its growth forecast in the last four months and further downgrades are pending, as there is no resolution to the ongoing civil war in sight. On 4 November, Crown Prince Mohammad bin Salman ordered the arrests of dozens of Saudi Arabia’s business and political elite, including princes, ministers and wealthy businessmen. Although this move was officially deemed a crackdown on corruption, it will also help Salman cement his political power. Oil prices hit an over two-year high in the aftermath of the crisis, and financial markets showed some volatility. While the impact on the economy is still uncertain, the crown prince’s bid to shore up power could strengthen his reform agenda geared at diversifying the economy away from oil. Moreover, political tensions between Saudi Arabia and Iran escalated after a missile launched by Houthi rebels was intercepted over Riyadh on 4 November. The Saudi government accused Iran of providing ballistic missiles to the rebels in Yemen. Economic activity should rebound next year on the back of higher oil prices and an improved fiscal position. That said, government spending will remain below levels last seen before prices collapsed in 2014. Moreover, spillovers from the ongoing tensions with Iran and domestic political unrest could undermine the economic recovery. FocusEconomics Consensus Forecast panelists expect growth of 1.5% next year, which is down 0.2 percentage points from last month’s projection. In 2019, growth is seen picking up pace to 2.3%. The non-oil sector continues to look sprightly: The PMI rose in October on the back of higher new orders at home and abroad, with employment increasing for the 18th straight month. However, as is the case across the Gulf region, oil production cuts have dented overall economic growth. In early November, the cabinet approved the 2018 federal budget. It is significantly more expansionary than last year’s, and plans a 5.6% increase in expenditure to further solidify non-oil growth, with a particular focus on education, health and other social development programs. The cabinet simultaneously aims for a balanced budget, reflecting the greater fiscal space generated by the substantial uptick in oil prices in recent months. Although the federal budget is only a small part of total government spending - with emirate-level spending making up the rest - it remains an important weathervane of the overall direction of fiscal policy. Growth should pick up significantly next year, as the oil sector recovers and the non-oil sector benefits from preparations for the Dubai 2020 World Expo, which should boost fixed investment. FocusEconomics panelists expect GDP to rise 2.9% in 2018, which is down 0.1 percentage point from last month’s forecast, and 3.1% in 2019. The economy continues to recover, and growth reportedly picked up for the fourth consecutive quarter in the July-September period. In addition, the unemployment rate dipped to a multi-year low over the same period, while in October the PMI moved further towards positive territory. In early November, the IMF concluded the second review under the Extended Fund Facility. If the Executive Board signs off on the agreement, an additional USD 2 billion will be disbursed, on top of the USD 4 billion already distributed. The Fund once again praised the government’s progress in implementing reforms to reduce the size of the bloated public sector and improve the business environment. The latter will be further enhanced by the cabinet’s recent approval of executive regulations for the new investment law, which include tax breaks and faster approval processes for firms. International reserves rose to a new multi-year high in October, reflecting renewed investor confidence in the country. The economy should continue to gain momentum going forward. Recent investment and industrial licensing laws are likely to boost investment. Consumer spending should recover as inflation recedes, and the external sector will likely be strengthened by the weaker pound. However, security concerns—highlighted by the recent bombing of a mosque—will cloud the outlook. FocusEconomics analysts expect GDP to expand 4.3% in FY 2018, up 0.1 percentage points from last month’s forecast, and 4.7% in FY 2019. Annualized GDP growth accelerated in Q3, driven by strong private consumption and investment. Household spending grew at the fastest pace in more than a year, benefiting from a tight labor market and low inflation. Robust business confidence and low interest rates pushed firms to invest heavily for a second consecutive quarter. Despite stellar headline growth in exports, growth excluding diamond shipments and startups was tepid, no doubt hit by the stronger shekel. Leading indicators from October have been reassuring; economic activity ticked up on stronger inbound tourism, while consumer confidence hit an all-time high amid nearly full employment. Although the PMI declined for a second straight month in October, stronger imports of manufacturing inputs signaled the manufacturing sector’s underlying health. Household spending is expected to drive economic growth next year, supported by the tight labor market and high asset values. The Bank of Israel’s loose monetary policy and the government’s medium-term infrastructure plans are expected to boost fixed investment. Downside risks will continue to include the possibility of flare-ups in Israeli-Palestinian tensions, which could halt the tourism sector’s recovery. FocusEconomics panelists expect growth to reach 3.4% in 2018, which is unchanged from last month’s forecast. For 2019, our panel expects 3.2% growth. According to a regional aggregate produced by FocusEconomics, inflation accelerated in October to a four-month high of 4.3%. The print exceeded the 4.1% tallied in the previous three months. It reflected higher price pressures in eight countries in the region, including Bahrain, Kuwait, Qatar and the United Arab Emirates. In Egypt, inflation is losing momentum, reflecting a more stable economic environment. That said, inflation remained above 30% for the fourth consecutive month. Consumer prices declined for the tenth consecutive month in October in Saudi Arabia. A weaker U.S. dollar will lead to higher import prices for the region’s economies with a currency peg. Moreover, the implementation of a VAT in Gulf Cooperation Council countries and higher commodity prices will boost prices next year. FocusEconomics panelists forecast regional inflation to accelerate from 4.6% in 2017 to 5.0% in 2018, which is, however, down 0.1 percentage points from last month’s estimate. In 2019, inflation is expected to moderate to 4.7% as price pressures stabilize in Egypt and the base effect from the VAT fades.